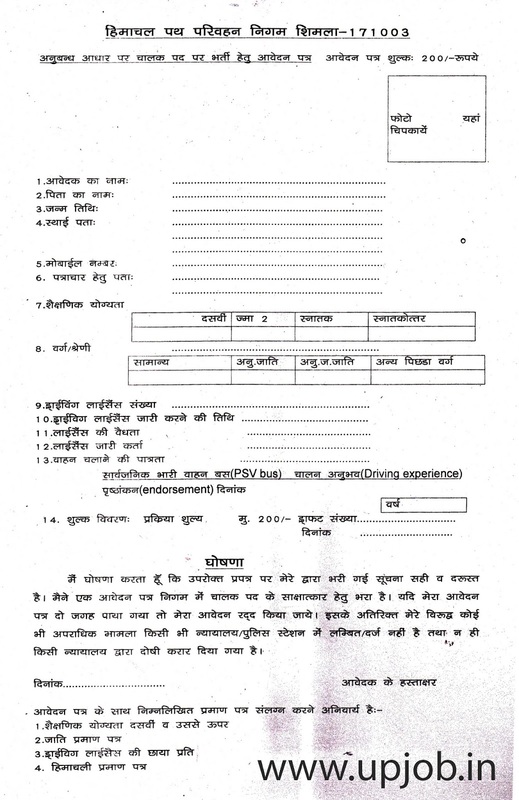 Himachal Road Transport Corporation HRTC, published the official recruitment notification for filling posts of transport multipurpose assistant in Himachal road transport corporation. Application form is invited online from the eligible candidates. Male and female both can fill application form for assistant posts in HRTC. Total number of vacancies are 1000 including different categories. Selected candidates will be appointed n contract basis on fixed honorarium of rs 5500 per month. Selection of the eligible candidates will be based on though the written examination. Salary – rs 5500 per month. Eligibility criteria – only resident of HP can fill application for this post. Education qualification – matriculation degree and have valid conductor license. Selection procedure: selection of the eligible candidates will be based on though the written examination. Difficulty of the question paper will be matric level. Questions will be asked from English, Hindi, Mathematics and Traffic Signs & Rules multiple choice questions. How to apply: all eligible candidates can fill application form online at the official website of HRTC. The screening test will include objective type questions (MCQ) of 200 marks. The syllabus for the screening test/written examination will consist of Course concerned, General Knowledge including General knowledge of Himachal Pradesh, Current Affairs, Everyday Science, Logic (Hardware, MS Office, MS Excel & Power Point Presentation), General English of 10+2 level and General Hindi of Matric Standard. Salary: rs 6 000 rs and rs 12000 as encouragement allowance. Selection procedure: selection of the eligible candidates will be based on through the preliminary screening driving test, a personal interview test. Preliminary driving test will be held on 8 august 2016. All those candidates who will be declared qualified in the preliminary driving test they will be call on the basis of academic merit for Final driving test which will be held on 1 September 2016. How to apply: all eligible candidates can fill application form in prescribed application form format which is available at the official website of HRTC. Candidates are required to attach demand draft and photocopy of all related document. Address where to send application –chetriya Prabandhak karyalaya , Himachal road transport corporation .